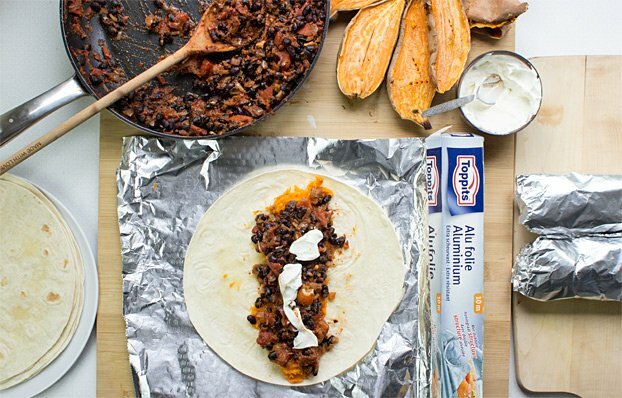 There are several reasons this sweet potato burritos recipe came about, each of them important in its own way. One, it tastes so damn good it would be against our professional ethics not to share it with the world. And we’re professional if nothing else. Two, the sun came out a couple of days ago (it’s gone again now) and put us in holiday mode. I love my trips to Spain and Hauke lived there once upon a time, so we’re currently hankering after some proper sunny food – Spanish and Mexican spring to mind. Three, we wanted an easy, family friendly recipe. You know, the sort that’s easy to follow, easy to make loads of, and the type of thing the whole family will enjoy. Very luckily for us, we have a new chef (as part of our ever-growing kitchen squad) – based in Spain no less – the lovely Lorena. Hailing from Barcelona, Lorena has been a professional chef for 14 years, and is currently the head chef at Coconut Club, Barcelona. Her experience is obvious in this fantastic recipe. When we approached Lorena she told us about her passion for Mexican food – and told us she could improve our blog with it. How right she was. 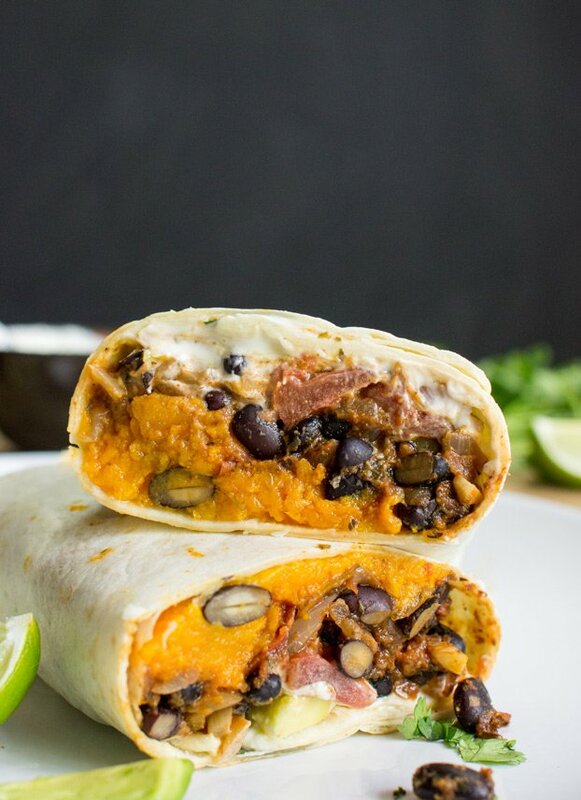 She hit us with these sweet potato burritos and winning partnership was born. They’re next level stuff. This amazing burrito recipe is a fantastic fusion of cumin and lime, paprika and garlic and it really hits the spot. If you’re a spice lover then you can add a little chili powder for that extra kick – and there’s some optional coriander too (I said optional, coriander haters!). 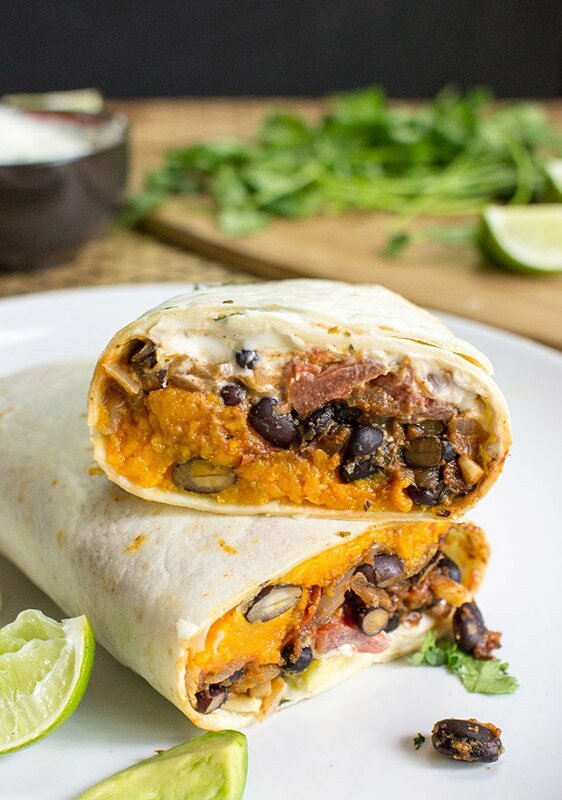 These sweet potato burritos have quickly become a family favourite – they’re very easy to make more for larger groups, little extra effort is required. You can also make large batches and freeze the leftovers. Just whip out a fresh tortilla wrap and you’re ready to go again. Nice! Sometimes we have to think quite deeply about making our recipes as nutritious as possible, perhaps slipping in a few leaves of spinach here, or a cube of ginger there. No such thing is needed with this one – it’s based primarily on sweet potatoes, black beans and avocado so it pretty much writes itself. Sweet potatoes are an exceptionally good way of hitting your body’s nutrient and vitamin count. More and more studies are coming through all the time, and it’s clear that sweet potatoes are a winner. One of the best natural ways of making sure your body gets all the vitamin A it needs, its high levels of beta-carotene are off the charts (well not literally, but they’re at the very top anyway). Africa, India and the Caribbean are using sweet potatoes to make sure their kids get enough of the right stuff, and we can learn from their examples. Black beans are well-loved on this site, and for good reason. High in both fiber and protein, they’re an excellent source of both. Whether you want to build muscle, help weight loss or just improve your digestive system, these are a great way to help. And finally, the lovely avocado that needs no introduction. These self-regulating little vitamin bombs are really high in vitamins K, B6 and C – and the best news – they come with their own ‘good’ fats. These fats are needed for the body to absorb the vitamins better – a perfect combination. 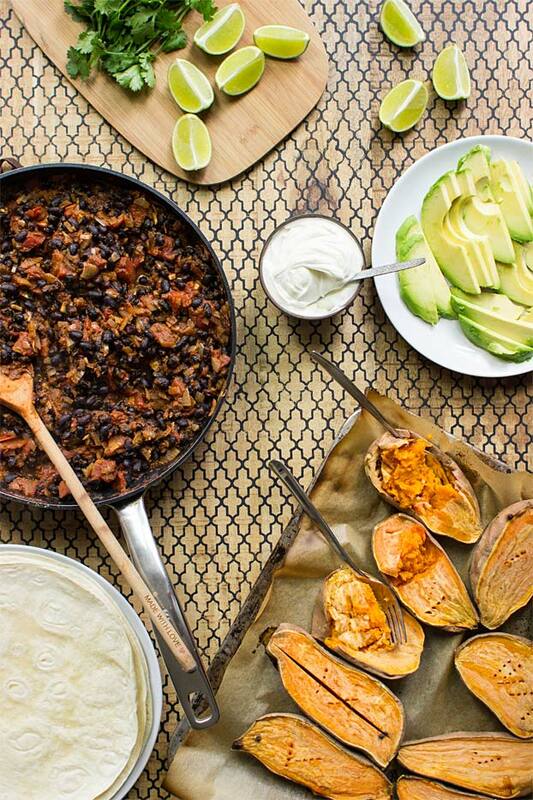 So – Mexican dish, Spanish flair and a whole load yummy nutritious goodness. 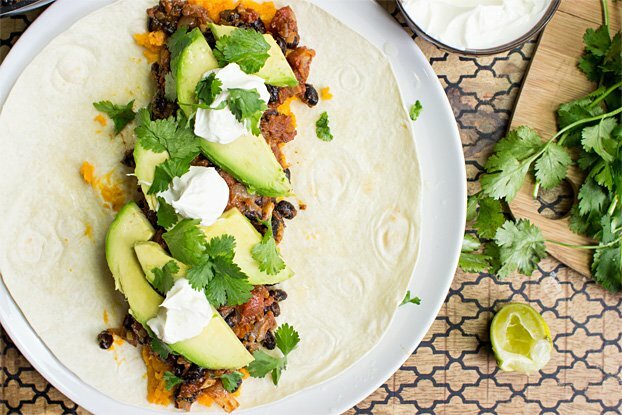 These sweet potato burritos are just what we’ve been waiting for. Thanks Lorena! 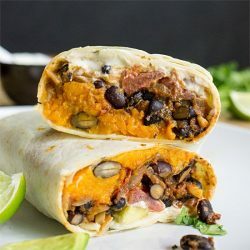 Sweet Potato Burritos - bursting with Mexican flair and tantalising flavours, this authentic recipe is easy to make for one or the whole big family! 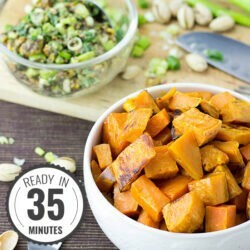 Slice the sweet potatoes in half and roast them in the oven until tender (about 45 mins). Finely slice the onion and chop the garlic. Heat up a pan and add the olive oil and onion. Cook for 3 minutes then add the garlic. Fry for another minute or so then add the tomatoes and leave to simmer on a low-medium heat for 10 minutes. Add the cumin, paprika, salt, pepper and oregano about halfway through. Drain and rinse the beans and add to pan, simmering for another ten minutes. Peel, de-stone and thinly slice the avocado. The sweet potatoes should be ready now too - it’s time to make our burritos! Scoop out the sweet potato “mash” from their peels, take out a wrap, layer some of the potato and spread with a fork. Add the tomato/bean mix and avocado slices down the middle of the burrito. Now garnish with avocado slices, sour cream, lime juice and cilantro. Roll, and cook in a large pan for a 30 secs - 1 minute on each side. Tip for families: use the oven instead. Place the burrito in the oven for 3-5 minutes on 200°C/400°F. When they’re done, you’re done! IF YOU LIKED THIS RECIPE: then you definitely need to check out our Tangy Veggie Wrap. Oh, and don't forget to make some excellent guacamole, because it goes always well with wraps! What a delish recipe, Lorena! If you want to see more of her creations check out her instagram. She's got some skillz! That was a good recipe. I had it for dinner. Now I have three more dinners ready to go. I think I will try freezing one burrito to see how it handles being frozen. I requested the diet plan, twice, but it does not respond to the request. I would appreciate it if you could send me the plan. I also made Indian rice, Jamie’s way and plan to portion it out and freezing it too. I’m really enjoying your website. I’m disappointed with the quality of meat that I buy. I bought a few chicken breasts and pan roasted them but at the end of the cooking time, the breasts were floating in an inch of water. That was a big turn off. They must be injecting the chicken. Thanks for your delicious recipes. So far they are very good. Love the site. I am my vegetarian journey again. I am just not able to justify eating meat anymore. I want to cause no more suffering if possible. I have tried this once before and my hair thinned terribly. I am hoping this time with your help I will be able to get enough protein. 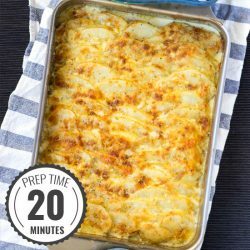 What kind and size of tortillas do you use for this recipe? Good luck with your food journey, Shelley! Hi, I was a vegetarian for quite a while and then went vegan. I started to lose energy, so returned to meat. I love animals and am increasingly finding it difficult to eat meat. I know that I can do well with a good vegetarian diet. I’ve been trying vegetarian eating, but my meals are very out of balance. I decided to find a good eating plan before I give up and return to meat. Then I found you and can see that your plan is well balanced, and the food looks delicious. Thanks for being there. It’s fixed now! I hope the burritos turned out great though! Holy COW were they good! I never though all of those foods would taste SO good together!! Even my husband and 2 out of the 3 teenagers loved it! (My picky teenager did not, but that is no surprise, since it is not pizza. lol) I was able to make 6 burritos with all the fillings, since we were using the small tortillas. Even with a dinner and lunch, I still have leftover tomato mixture. Got any other recipes I can sub this delicious mix into? Thanks for the great recipes!! Niceeeee, 2 out of 3 is pretty good indeed! I love these burritos. I’ve made them several times now and they are so delicious. 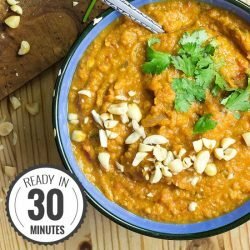 I would love to see more recipes like this, full of easy to find ingredients! So glad you like these burritos, CeCe!! Actually, we just released a nice recipe that fits the bill (imho): Our Chickpea Wrap! Great burritos! Very little prep, but lots of flavor. Can I make Gia a day ahead? What will avocados do? Obviously they will be wrapped up so not exposed to air?? ?